Arunachal Pradesh Chief Minister Pema Khandu on Friday reiterated his call to all the politicians, especially ministers, parliamentary secretaries, MLAs and party workers to be active on social media and reach out to the people. He said social media like facebook, twitter, instagram and even watsapp can be utilized to the optimum to create awareness on government’s policies and programmes and also highlight the government’s achievements. 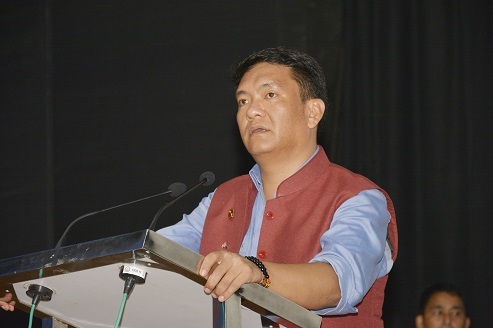 Speaking at a workshop on social media, organized by the state BJP IT Cell at the Dorjee Khandu State Convention Center in Itanagar, Khandu said social media is a two-way interactive medium where people in government and party receives feedbacks from the people upon which they can work to further improve their performances. “Social media has changed the very definition of communication. Today everyone is on one or the other social media platform and these platforms have become the best and strongest mediums of communication with the people,” he pointed. The Chief Minister said that smart phones have become a necessity in today’s world as it has gone beyond its boundaries of mere voice calls and short messaging services (SMS). “The best part of social media for us is that we can show to the people what we are doing, what we have done and what we want to do in real time. Our MLAs, ministers and MPs work a lot. They tour interiors places in their constituencies, they oversee works being implemented, take review meetings with officers, launch new and innovative programmes but people in rest part of the State or the country are not aware of these. They can now highlight their efforts on social media and also get feedbacks from the people,” Khandu observed. Social Media and IT convenor of State BJP, Vijay Sonam earlier explained the nuances of facebook and twitter and appealed party workers to become active and reach out to the people for the party to grow stronger in the state. The workshop was attended by all ministers including Deputy Chief Minister Chowna Mein, speaker T N Thongdok, deputy speaker Tumke Bagra, parliamentary secretaries, MLAs, state BJP president Tapir Gao, BJP state office bearers, district unit leaders and karyakartas.